In our neighborhood in DC there is a great taco truck that comes every weekend. The one downside is that it’s tough waiting a whole week in between taco fixes. The solution…make them at home! Of course they can not be as good as the magical tacos from the truck, but they’ll still be pretty damn tasty. We made our tacos using small flour tortillas. To get them soft, microwave them for about 30 seconds, covered with aÂ wet paper towel. Another option is to warm them in a dry pan on the stove; you can even brush them a little olive oil for flavor if you are going the stove route. To help combat breakage, double up on the tortillas and use two per taco…double layer style. I over cooked the steak because I was just following the cooking time. Don’t make the same mistake I did–check for doneness by pressing down on the steak to check its firmness or cutting into it to peek on the progress. The original recipe had a 4 minute cooking time for each side, I have reduced that to 3 minutes. Cut off any gristle and large amounts of fat from the steak. Combine all the spices and salt in a small dish. Coat the steak with the spice rub. Let the steak sit out for about 20 minutes or so. This will allow it to get up to room temperature and give a little time for the rub to kick in. Get two pans going on the stove. One pan, preferably non-stick, will be used for sauteing the onions. The other pan will be used for cooking the steak. Cast iron works create for cooking steak, but any type of pan will do. The pan for the onions should be set to medium heat. Add a bit of oil, and when it is hot, add the onions. Add some of the remaining spice rub, if there is any left. Stir every now and then. While the onions are cooking, set your steak pan to high heat. Once the pan is hot, add some oil, maybe a 1 or 2 teaspoons. Add the steak and cook for 3 minutes on each side. Check for doneness– the steak should be pink inside, somewhere between medium-rare and medium. Cook longer if you think the steak needs a little extra time. 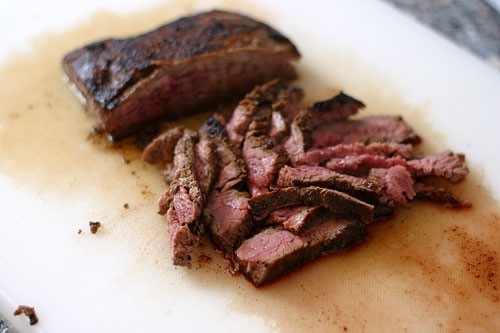 Remove the steak and place on a cutting board. Cover with tinfoil and allow it to rest for 5 minutes. Check on the onions and give them a little stir. They should be cooked through and looking yummy. 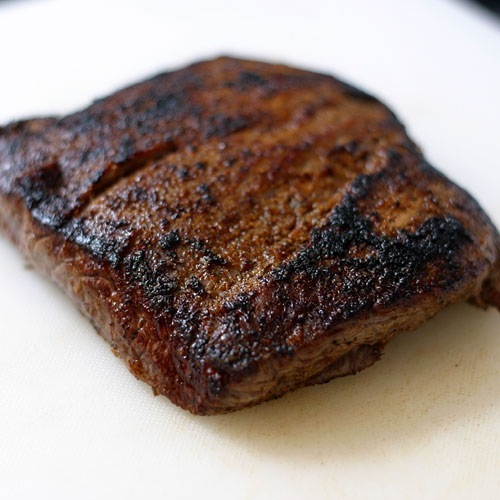 After the steak has rested, cut it into thin slices. Be sure to cut the steak against the grain. Warm your tortillas and then make a little taco. Add steak, onions, salsa and cheese. These look great. 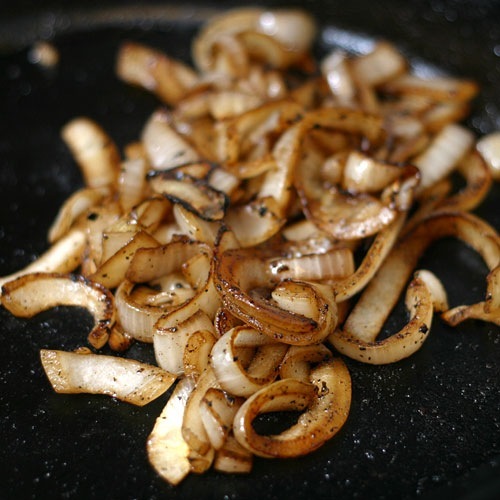 I love the addition of the sauteed onions, which I also do, although I don’t think its very traditional. I make a similar version, you can see the video here, http://tiny.cc/9v2xp, but I also marinate the meat in citrus, spice and herbs….great job. Thanks for posting. Beautifully photographed and well written. I am going to make this for my wife tonight.Thanks! Sounds amazing. I love mexican food. For me the key is good tortillas, they really make tacos that much better. These look awesome, and pretty easy to do. Thanks! I was shocked to find this recipe so quickly! This page was the first google response to my search. I am pleased to say I have now found a recipe that mimicks my favorite dish at my favorite mexican restaurant! Thank you so very much! I hope you don’t mind, but I’d love to link to this site on my blog! Yum — how about adding a bit of green chiles to the onions? Would be quite a kick! That steak just looks perfectly cooked! 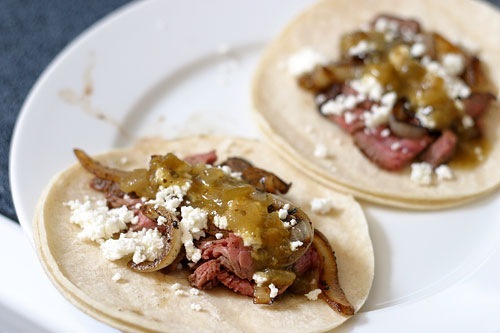 Fabulous steak tacos!